Royal Brunei Airlines (RB) and Lufthansa Technik have signed a ten-year contract covering component support for RB’s A320 and upcoming A320neo fleet. The scope of services includes repair management for a comprehensive range of line replaceable units, provision of critical inventory at RB’s home base in Brunei and access to Lufthansa Technik’s global network of component pools. In addition, Lufthansa Technik will support Royal Brunei Airlines with the c.more® product, a supply management solution for consumables and expendables. 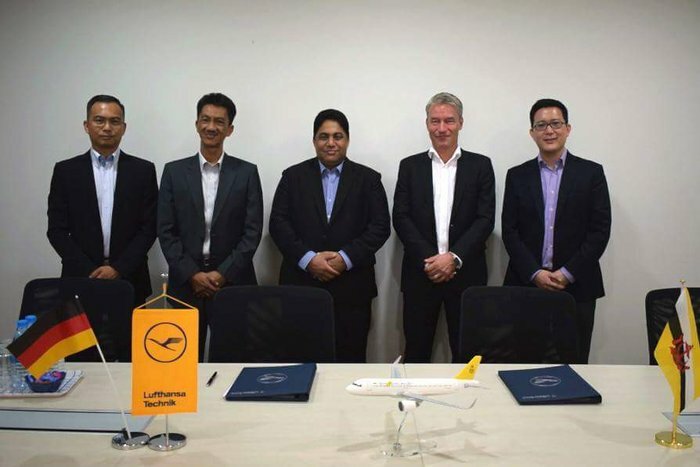 “We are delighted to partner with Lufthansa Technik for the component support program. They are one of the best Maintenance, Repair and Overhaul organisations in the world and we believe through this partnership we can leverage their expertise for our benefit. We believe that with Lufthansa Technik’s extensive experience on the A320 aircraft together with our ability to access their regional pools – particularly in Singapore and Hong Kong – we will receive optimum support for our Airbus fleet” said Karam Chand, Chief Executive Officer of RB. “We are thrilled to have been selected by Royal Brunei Airlines and look forward to a successful partnership. We trust that our cost competitiveness and technical expertise will contribute to the growth of Royal Brunei Airlines. In addition, we are convinced that the unique proposition of our regional pools will provide the highest level of operational stability to Royal Brunei Airlines,” explained Zang Thio, Lufthansa Technik’s Vice President Sales for South East Asia and Australia. The Lufthansa Technik Group, with more than 30 subsidiaries and associates and over 25,000 employees worldwide, is one of the leading providers of technical services for the aviation industry. Its portfolio encompasses the entire spectrum of services for commercial aircraft: maintenance, repair, overhaul, modification and conversion, engines and components.